2.5 Octave Bells (F5-C8) with durable ABS plastic side frames. 13”x5” Steel Snare Drum with Hairline Nickel Finish - a high quality sensitive and responsive drum for a positive student experience on a full size drum. Pearl quality Height adjustable Bell Stand with simple on/off mechanism for quick setups and teardowns. Separate heavy duty "basket-style" snare top featuring a no-slip angle adjustment. PLBC-8 Nylon backpack style carrying case with reflective stripe and built-in wide-set roller blade wheels, and heavy duty multi-stop height adjustable retractable handle. Padded bag has separate zippered compartments for all components for maximum protection and easy access. 8" tunable practice pad with stand mount features a realistic drum feel. Graphical set up instructions are permanently affixed to the bells. No set up manual to lose. Music rack attaches to the bells. Eliminates the need for a separate music stand. 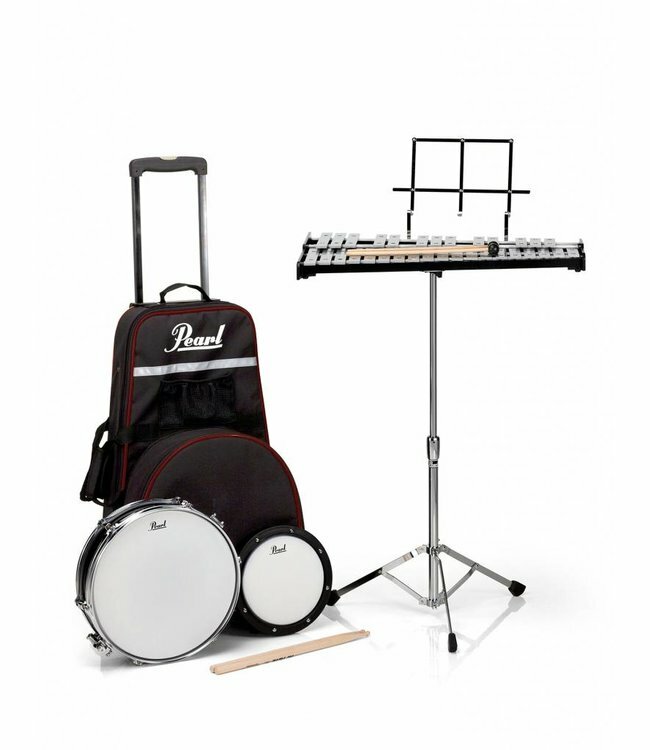 Plastic mallets and Vic Firth sticks are included. A complete kit ready to use with no added purchases.